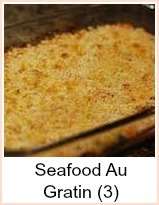 The best of both worlds - baked seafood recipes - make up your recipe and leave it in the oven to cook itself. 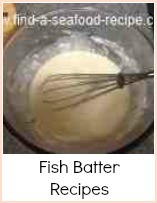 What could be simpler than taking some fish, pouring over some wine or stock and herbs and leaving it to cook on its own. 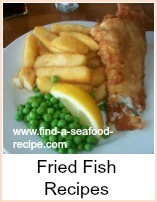 I have a selection of fish recipes from around the world. Spicy gougons with lovely dips for a finger style buffet. Stuffed salmon and sea bass. From the exotic to the simple, elaborate to quick. 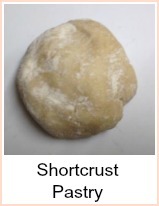 Many of these dishes can be prepared in advance - say before you go out to work - and then when you get home, switch on the oven and it cooks itself in next to no time. 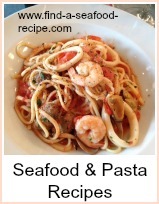 Click on any of the photos to go to the recipe - enjoy! 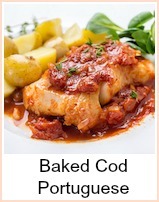 Quick and delicious - Cod Portuguese. 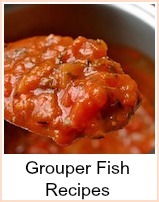 Tomatoes, pepper and paprika go to make this an authentic tasting dish. 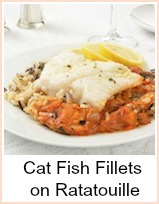 Baked cod with a prawn sauce - lovely family meal. 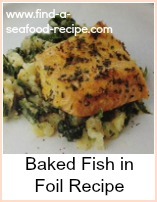 A versatile baked fish dish - ideas to use different fish, toppings, sauces and instructions to make the sauce. 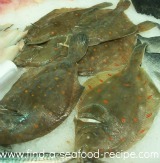 Delicious Halibut with Mussels and Baked Sea Bream. 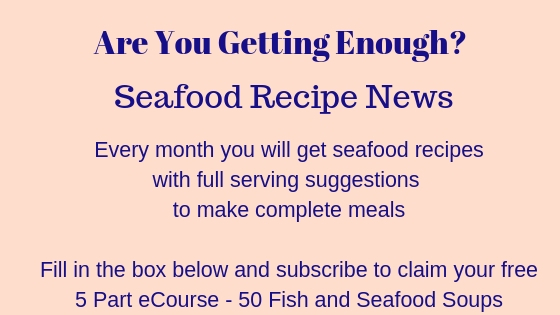 Including guidelines for cooking large whole fish. 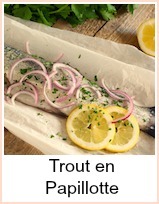 Baked Trout en Papillotte. 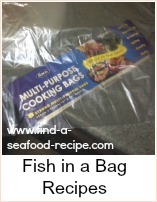 This classic method of cooking in paper is suitable for any small whole fish. 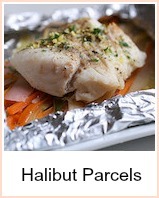 A tasty succulent method of baking cat fish over a bed of ratatouille. 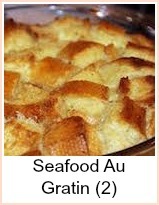 Mop up the juices with some fresh crusty bread for a complete meal in one pot. 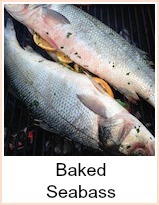 Basa Fish goes Mexican! 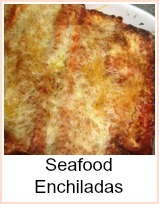 Seafood Enchiladas - tortillas with a seafood filling, spicy tomato sauce and topped with cheese. 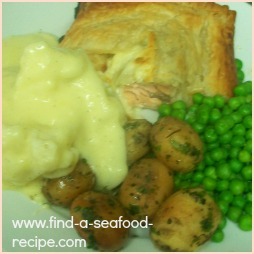 Lovely golden puff pastry encasing fish in sauce - let the kids help you roll out and decorate this pie. 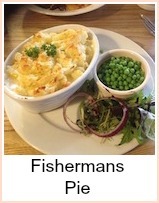 A tasty combination of white and smoked fish and vegetables with a crumble topping - a lovely family meal. 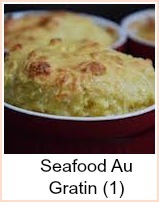 Lovely mixed seafood in a white sauce with a mashed potato topping. 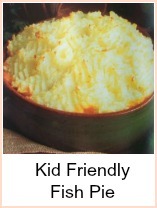 Good enough for a dinner party or as comforting nursery food. 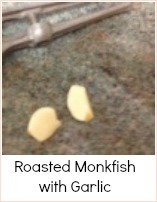 A couple of really tasty grouper fish recipes. 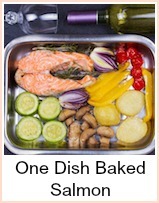 One with courgettes, onions and tomatoes baked au gratin and the other with tomatoes, olives and wine - delicious. Quick and simple enough for a family meal or a dinner party - how about a meat free Sunday roast? 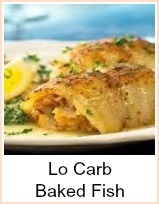 Lo Carb doesn't have to be boring. 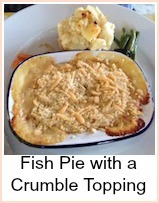 Here are a couple of baked seafood recipes for Cod in Cider and Plaice in Wine - delicious AND low in carbohydrate. 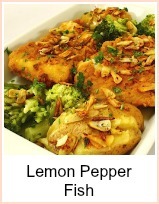 A simple baked cod dish with lemon and chopped chilli pepper - quick to prepare and very tasty. 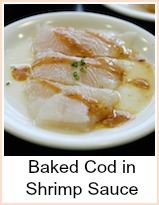 Mackerel is high in Omega 3s and good for a healthy heart - here it's cooked in cider - simplicity itself. 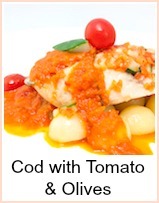 Orange Roughy Fish with fennel and tomatoes. 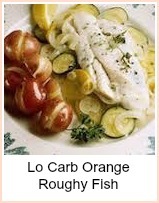 A delicious lo carb recipe - if you're following the Atkins Diet, this dish contains 4.5g carbohydrates per serving. 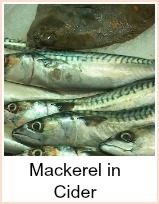 Easy baked seafood recipes for pickled mackerel and herrings, plus ideas for other mixtures. 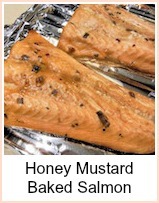 Includes a link to - gravad lax - pickled salmon or trout. 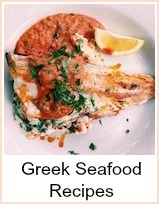 One of my favorite fish roasted simply - a fabulous dish - give it a try, you won't be disappointed. 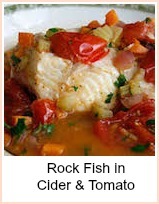 Two delicious baked seafood recipes for rock fish (catfish, rock salmon, rock turbot) one casseroled in cider and one with tomatoes. 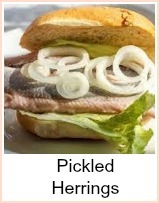 Easily adaptable for different types of fish. 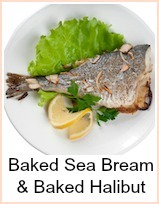 Delicious baked sea bass with rosemary potatoes and broccoli, finished with a buttery sauce from the roasting juices. 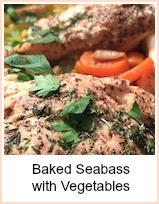 Seabass with fennel and olives - a really simple baked seafood recipe which would be good for a family meal or an impressive dinner party. 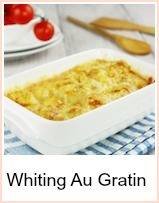 Delicious Cod Au Gratin - makes a lovely family meal. 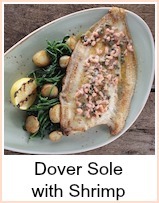 Luxurious Plaice with Prawns Au Gratin. 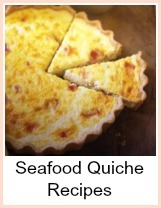 A dish fit for entertaining. 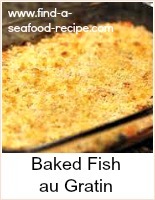 This seafood au gratin recipe uses a mixture of shrimp, scallop and flounder. 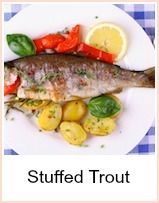 Recipe for Stuffed Trout. 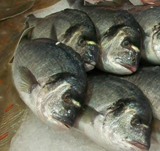 General tips about types of fish suitable and cooking times. 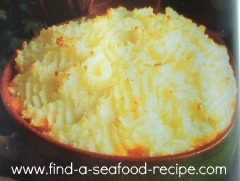 Try Mullet, Bream, Bass, Mackerel with this delicious stuffing. 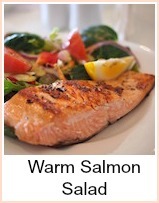 Warm Salmon on a bed of mixed salad with a cool and refreshing minty yoghurt dressing - just right for a summer's day.